Ubiquitous coffee retailer Starbucks is now operating in 60 countries and has more than 18,000 retail store locations. Looking at those statistics, you might be perplexed as to why Starbucks even bothers with things like improving presence on social media given their existing enormous customer base. Actually, the company has proven that it’s not only willing to embrace social media, but also recognizes the techniques necessary to stimulate communication among their target audience. Keep reading to discover some of the tactics the company uses, and why they’re so effective. Starbucks recognizes that it’s harder for messages to spread without help. If you’ve ever logged onto Facebook and noticed a graphic, link or video that thousands of people have shared, you probably felt compelled to check it out yourself, even if it was an unconscious reaction. To stimulate visibility beyond the online realm, Starbucks rang in the holiday season by offering a “buy one get one” promotion for the perpetually popular line of holiday beverages including peppermint mocha, gingerbread latte and eggnog latte. The campaign messaging even tapped into a person’s desire to share with others by encouraging customers to buy one drink to enjoy, then give the free beverage to a friend. More recently, with the debut of Blonde Roast coffee, the chain distributed electronic codes worth just enough money for a person to buy a single serving of the new brew. In this case, the retailer seemed to think that the distinctive, lighter taste of the coffee would communicate best by appealing directly to the taste buds. Although print advertisements were used as well, word of the electronic codes spread quickly via Facebook and reached other areas of the Internet. For years, Starbucks has furthered the idea that the company should use its global influence to provide similarly far-reaching benefits for others. Usually, this happens by way of campaigns for certain charities. However, these efforts are often made in timely ways that correspond with holidays or events that are already cemented in a person’s mind. For example, campaigns around Veterans Day might focus on people who are serving in combat, while this year’s World AIDS Day gave people the chance to donate five cents of the cost a cup of coffee towards an AIDS-related charity. Through outreach methods like these, the company aims to demonstrate how they can seamlessly blend sales with matters that impact the world at large. 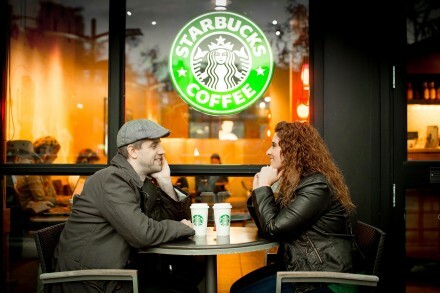 Since Starbucks locations are situated all over the world, one might argue that a person will have a nearly identical experience whether they pop in for a caffeinated beverage at a Starbucks location in Dublin, Ireland or the heart of Times Square, New York. In some ways, this is true. After all, the coffee chain prides itself on being consistent with attentive customer service and delicious beverages. However, some characteristics are unique to a local area. For example, in Charlottesville, Virginia, home of the University of Virginia, a Starbucks location on the outskirts of campus has a chalkboard that wishes students luck on final exams, and even features a cartoon drawing of the university mascot. These efforts prove that it’s possible to be successful without resorting to complete conformity. Although these principles worked well for one of the world’s most well-known coffee chains, they can be applied in equally effective ways when it comes to your own communications. Whether you’re reaching out to a friend, or trying to gain traction with a business venture, you can learn from Starbucks. Trish Little is a blogger for marketing and PR blogs. Interested in managing brand communications? You might want to get your online communications degree from USC and jump into the field.